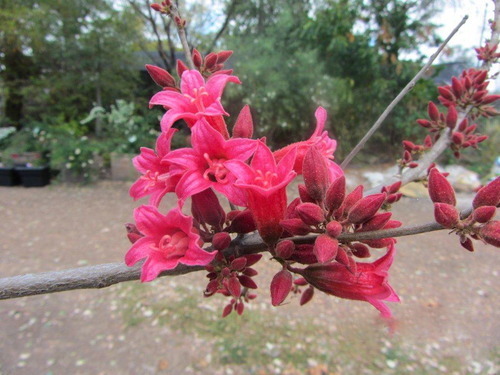 Spring is a common time to see Brachychiton blooming, however not all varieties flower every year, so sometimes their display is a pleasant surprise following years of quietude. 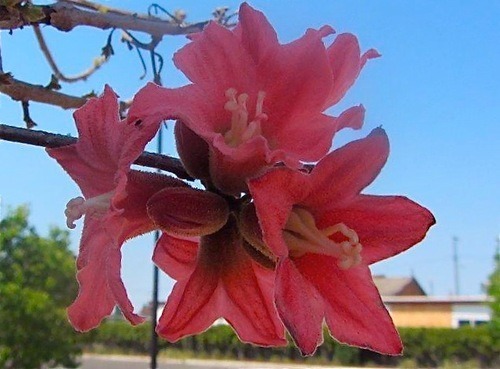 The Brachychiton name is usually attached to the Flame tree Brachychiton acerifolium, or the Bottle tree, Brachychiton repestris but the baby of the family is Brachychiton bidwilli and it is worth considering as a small tree for the garden. 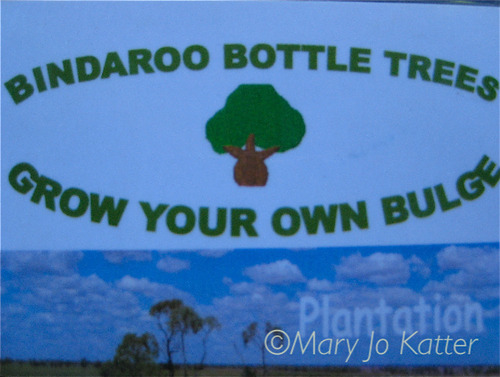 This tree is naturally occuring over wide areas of Queensland, usually in sunny situations or not too far inside open hardwood forests, according to Keith Williams, author of “Native Plants Queensland”. Its growth can be variable – two to six metres – often looking more like a large shrub in tough situations. Flower colour of the seed-raised trees is also variable, ranging from orangey pink, to hot pink with yellow stamens. 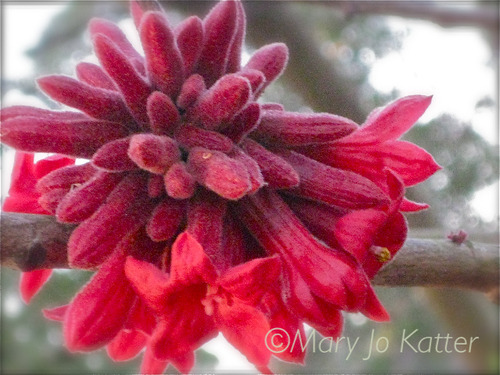 The unusual feature of the flowers is that they appear along the trunks,stems and branches of the tree. They’re great for attracting birds into the garden and are usually, but not always, deciduous while flowering. 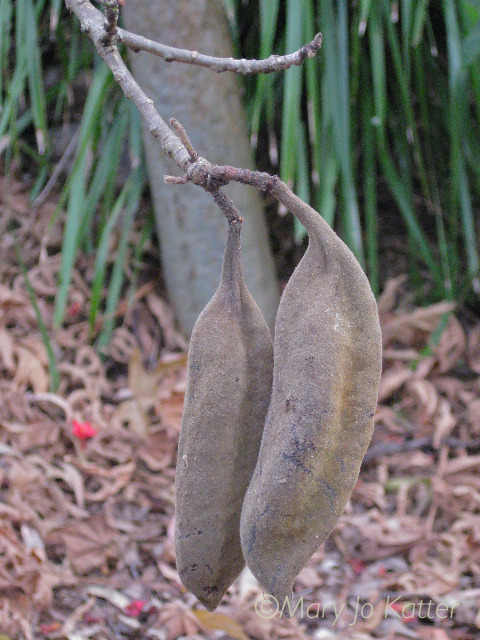 Unlike the larger leaved Brachychitons, when the leaves of the Little Kurrajong fall, they are not too untidy. The seed pods are also a feature, lasting on the tree for some time. Plants readily grow from seed, (if you can beat the birds to it!) available when the hard pod breaks open. Recently, I was talking to Elizabeth Nolan (above) from Roma who is a big fan of all the Brachychitons. 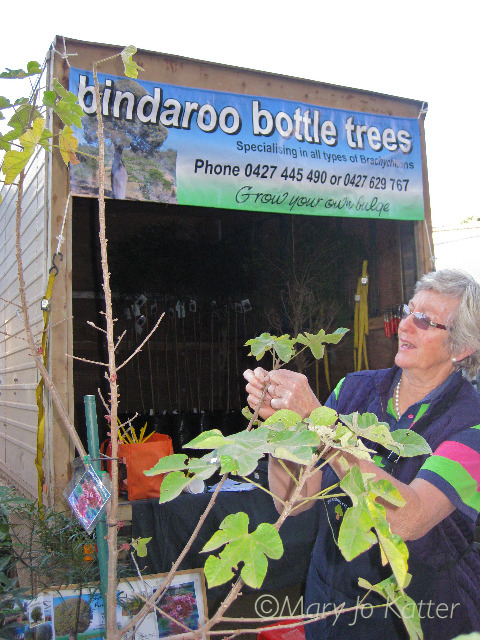 Elizabeth and husband John run Bindaroo, a thriving nursery business online, and by phone, specialising in Brachychitons in all sizes. They can send trees anywhere in Australia. 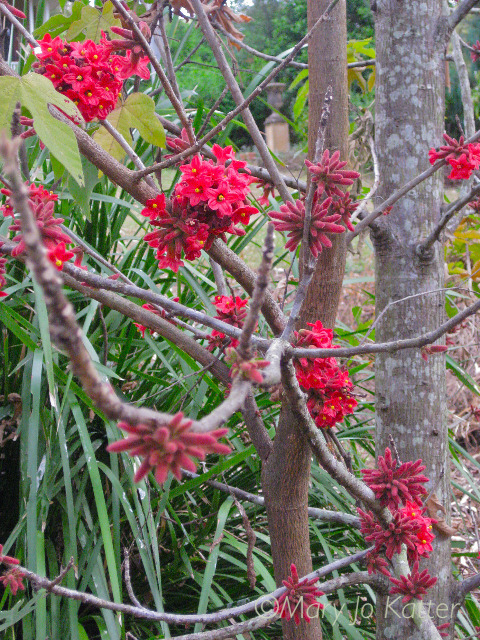 Elizabeth says the grafted Little Kurrajongs have spectacular flowers at the moment. Her tip is to be careful tidying/taking off the dead leaves as this leaf junction can be a flower point. 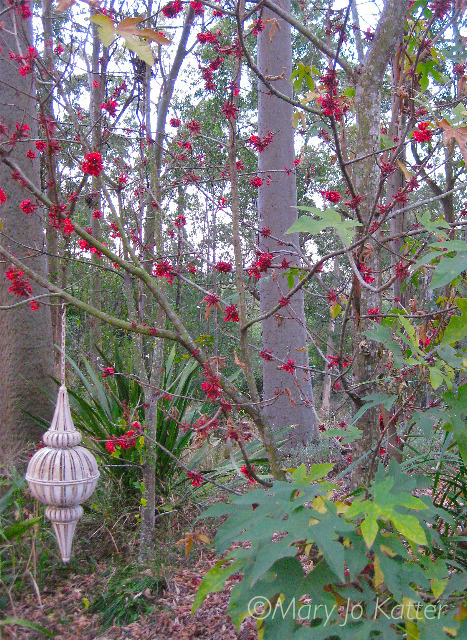 Many thanks to Elizabeth for sharing these pics of fabulous flowers from Bindaroo trees.